All three evening newscasts on Tuesday and two out of the three morning shows on Wednesday skipped the dramatic story of an elderly Florida man who saved a cafe full of people from gun-wielding robbers. Only Good Morning America covered the story of seventy-one-year-old Samuel Williams using his own weapon to fend off attackers. However, Florida is a "shall issue" state. It's the carrying of the concealed weapon that requires a permit, not a "gun license" to own one. Stephanopoulos offered a snarky quip after the segment ended, critiquing the old man: "And what a uniform. Bermuda shorts and a golf cap." CBS This Morning, NBC's Today, as well as World News, Evening News and Nightly News all ignored the story. Morning News Shows Favored the Anti-Gun Position by 13 to 1. More than half of morning news gun policy segments (208) tilted away from balance. Of those segments, 93 percent (193) pushed the liberal, anti-gun position, while only six percent (15) promoted the pro-gun position. ABC’s Good Morning America (92 to 1) was the most biased morning show. GEORGE STEPHANOPOULOS: Look at this stunning moment caught on tape. Two robbers go in to hold up an internet café and what a surprise they got. 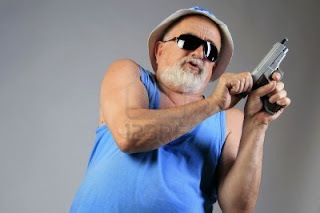 A 71-year-old man steps in, pulls out his own gun. There he is right there. Takes them on. Saves the whole café. We'll have all of that in just a little while. ROBIN ROBERTS: He wasn't going to take it anymore. JOSH ELLIOTT: And a brazen hold up in Florida didn't exactly go off as planned, again, thanks to one gun-toting senior citizen. Look at the surveillance video. Again, we just saw it, but two armed robberies storming an internet cafe. Watch the back right of your screen. Seventy-one-year-old Samuel Williams is not taking that anymore. Pulls his own gun, takes aim and would save the day. The suspects actually made a run for it. They were hit twice as they flee out the door. The suspects later arrested. We should put out, Williams does have a gun license and is not expected to be charged. Remarkable. STEPHANOPOULOS: And what a uniform. Bermuda shorts and a golf cap.